Britain’s Prince Harry and wife Meghan arrived in New Zealand on Sunday for the final leg of their Pacific tour, their first international Royal tour since marrying in May. 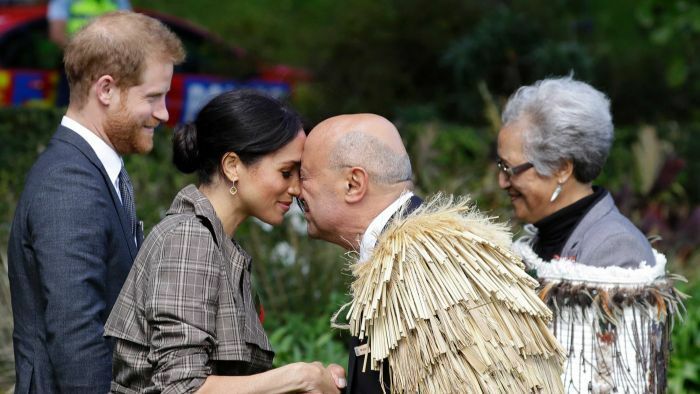 The Royal couple, who have already visited Australia, Fiji and Tonga, were received in the nation’s capital Wellington by Prime Minister Jacinda Ardern. The globally-popular Ms Ardern marked her first year as the country’s leader earlier this week, having formed government through a coalition deal that followed an inconclusive election. In June, Ardern became only the second world leader, after Pakistan’s Benazir Bhutto in 1990, to give birth while in office. Price Harry and Meghan are expecting their first child next year. The royal couple flew from Australia on Sunday after closing the Invictus Games in Sydney last night and were accompanied by several Invictus Games athletes from New Zealand. The Duchess of Sussex wore a brown chequered coat and a simple black dress, while Prince Harry was in a dark grey suit. Both had remembrance poppy pins on their chests. The New Zealand trip comes after the royal couple packed plenty into their trip to Australia, Fiji and Tonga, including the opening and closing ceremonies of the Invictus Games, a visit to Queensland’s Fraser Island and a ride on one of Melbourne’s famous trams. Along the way, Royal protocol took a back seat as beards were stroked, hugs were given and received and hearts were warmed during many memorable moments. If photos from Princes Eugenie’s recent wedding didn’t set tongues wagging about an impending baby announcement, photographs of the Duchess of Sussex touching down in Sydney carrying two large folders in front of her belly set the gossip machine in overdrive. Just hours later, it was official. The Royal couple were expecting. Baby Sussex’s first gift included miniature ugg boots and a stuffed kangaroo with joey. In her third meeting with Prince Harry, 98-year-old war widow Daphne Dunne, stole another kiss from the Duke of Sussex who commented affectionately on her pink dyed hair. But it was the Duchess of Sussex who seemed dazzled during her lengthy chat with Daphne, repeatedly exclaiming “how sweet” before saying she hoped to introduce her to their “little one” next time they were in town. Thousands joined Daphne at the Opera House hoping to catch a glimpse of the couple, although most viewed the occasion through their camera phones. There’s nothing like kicking off your shoes and walking along the sand of the iconic Bondi Beach to truly get into the spirit of an Australian visit. Prince Harry and Meghan joined OneWave’s fluro-clad “anti bad vibe circle” to talk about mental health issues. They listened as participants spoke of their mental health struggles, before Prince Harry told them of his passion to break down the stigma around anxiety and depression. Five-year-old Luke Vincent had little regard for Royal protocol when he repeatedly hugged Prince Harry and Meghan during their visit to Dubbo. The Buninyong Public School student, who has Down Syndrome, charmed the socks off the Royal couple, even giving Prince Harry’s ginger beard a gentle tug during an interaction that melted hearts across the world. The Duke and Duchess of Sussex were in Dubbo to see first-hand the effects of the drought and to unveil a new Royal Flying Doctor Service aircraft. The prince also showed off his sense of humour, comically swatting flies away as Ruth Sandow gave a speech marking the event. Damian Irish, who concocted the plan to snare the prince’s autograph, said he was “a great guy” despite rejecting his request. “He told us he’d love to sign them but he wasn’t allowed to,” Mr Irish said. The main reason for the couple’s visit was to open the Invictus Games, an event the former army captain created to help wounded, injured or sick armed servicemen and women in their physical and mental recovery. Prince Harry climbed the Harbour Bridge’s 1,332 steps with Prime Minister Scott Morrison and Invictus Games ambassadors as the event’s flag was raised high above Sydney. But the most touching moment came on the descent, as he embraced Invictus Games ambassador Gwen Cherne, whose husband took his own life after serving in Iraq and Afghanistan. She later told media how much she appreciated the prince’s interest in her story and his genuine support.